Got Gardening Questions? We’ve Got Answers. WSU Master Gardeners researching plant identification at the Extension office answer clinic. Need answers to your gardening questions? Whether it’s an insect pest infestation or an unknown pathogen destroying your beloved plants, certified Master Gardeners are available to answer your questions or provide advice. Gardeners may bring plant or insect samples to the clinic. 1919 NE 78th Street, Vancouver, Washington. Tuesday and Wednesday • 10 A.M. to 2 P.M.
Thursday and Friday • 11:30 A.M. to 3 P.M.
Visit one of the various Outreach Clinics throughout the community. Read more about our Answer Clinics, including information about specimen delivery and soil testing. This is a wonderful resource set up by the good folks at Puyallup Research and Extension Center with a wide range of gardening topics and also a blog. Visit Gardening in Washington State. HortSense is a compilation of fact sheets about managing common landscape and garden plant problems. It is intended to provide gardeners with information on how to manage plant problems and weeds using integrated pest management or IPM. Visit WSU Hortsense. PestSense is a compilation of fact sheets for managing common indoor pest problems. It is intended to provide information on how to manage common indoor pest problems using integrated pest management or IPM. Visit WSU Pestsense. The Garden News is a quarterly joint publication by the Master Gardener Program and the Master Gardener Foundation of Clark County. In each issue you will find articles about local and program gardening activities, books, tools, recipes, gardening tips and trick. You never know what our great reporters will write about next. So don’t miss an issue. Visit The Garden News. This is a handy guide of what to do in your garden all throughout the year. Download the brochure. 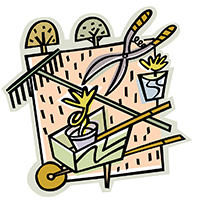 Visit Gardening Tasks. Master Gardeners KNOW gardening! Visit Garden Mastery Tips.